After another small dose of winter weather on Tuesday night, Arapahoe Basin ski area on Colorado’s Continental Divide announced on Wednesday that it will open for the 2016-17 ski season on Friday, Oct. 21. 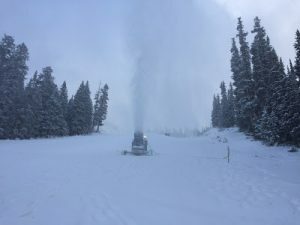 Snowmaking at Arapahoe Basin, which opens Friday, Oct. 21. Loveland Ski Area, just over Loveland Pass from A-Basin, announced Wednesday that it will open sometime next week. Loveland and A-Basin typically battle to open first in Colorado. Vail doesn’t open until Friday, Nov. 18, and Beaver Creek opens the following Wednesday, Nov. 23. Forecasters are calling for the weather to warm up and dry out through the weekend, with another storm system moving in early next week. Copper Mountain plans to open Friday, Nov. 11, and like Vail will host early race training for the U.S. Ski Team and other top athletes. Loveland also occasionally hosts ski team training. The World Cup racing season kicks off Saturday with a women’s giant slalom in Soelden, Austria, where Eagle-Vail’s Mikaela Shiffrin will compete. Vail’s Lindsey Vonn will not be in action for the opening GS, which is followed by a men’s GS on Sunday. SOELDEN, Austria (Oct. 19, 2016) – The fog has been swirling around the Rettenbach Glacier, creating an atmosphere of magic like something out of a fairytale. The spirit of ski racing is swirling around Soelden, too, as the crew preps the stage for one of the biggest shows in ski racing: the Audi FIS Ski World Cup opener kicking off the 50th anniversary of the tour. This Saturday marks the start to a jam-packed 2016-17 season, with 16 domestic alpine World Cups including Killington Resort, Beaver Creek Resort and Squaw Valley, and featuring World Cup Finals to end the season at Aspen Snowmass. The potential outcome at the World Cup opener is always a bit of a question mark for athletes, as it’s a testing ground of sorts. What is unquestionable, however, is their appetite for competition. They’re ready to get this show on the road. Ligety is the defending victor at Soelden, having won against a stacked tech field over France’s Thomas Fanara and Austrian rival and 2016 overall World Cup winner Marcel Hirscher. Plus, in each of the nine times Ligety has competed at Soelden, he’s finished in the top 10 and he’s podiumed seven times. To say Soelden has been good to him is an understatement, but this track is known for featuring the longest, steepest, most sustained pitch of any World Cup giant slalom on the tour. It’s relentless, and it’ll be a fight to the end for victory. On the women’s side, Mikaela Shiffrin (Eagle-Vail, CO) has had strong results in Soelden—including her first GS World Cup win in 2014 and finished second in last year’s race. This year, she will go head-to-head with last year’s victor Federica Brignone, whose speed and style are equally impressive. She’ll also have to fend off Austria’s Eva-Maria Brem—the 2016 giant slalom champion—on home turf, and don’t discount Lichtenstein’s Tina Weirather or overall World Cup champion Lara Gut of Switzerland either. After sustaining a knee injury that had her on the sidelines for a portion of the 2016 season, Shiffrin is feeling stronger than ever—which has shown in her on-snow training this summer. She is absolutely ripping. “I have a feeling of redemption, but I’ve had that feeling for the past three years with my giant slalom,” she said. “I feel like I should have been winning GS back when I won my first giant slalom in Soelden (in 2014), but I was inconsistent and didn’t have enough of the proper technique and tactics to really make it happen. Then last year it felt like the year it was really going to kick in, but when I got hurt it sort of threw off my timing a bit.” Now, she’s feeling like she’s getting it back. Veterans Julia Mancuso (Squaw Valley, CO) and Lindsey Vonn (Vail, CO)—the winningest female in World Cup history—will be sitting Soelden out. Vonn announced on Facebook late last week that she won’t be racing, saying, “I’m disappointed I won’t be there but my goals for this season are focused more on downhill and super G races.” Though Mancuso is back on snow and in gates, recently completing a camp in Soelden, she’ll continue to focus on recovery from the hip surgery she had last year. As of Wednesday, the U.S. Ski Team had confirmed two women for Saturday’s opening giant slalom and six men for Sunday’s race. The men’s team will be headlined by veterans Ligety and teammate Tim Jitloff (Reno, NV). Jitloff has his sights set on a return to the top 15 in the world. Also keep an eye on David Chodounsky (Crested Butte, CO), who is quickly becoming a two-discipline threat with some killer giant slalom results in 2016. Universal HD will cover the women’s giant slalom on Saturday at 3:00 p.m. ET and NBCSN will air the men’s giant slalom on Sunday at 9:30 p.m. ET. You can also catch all the action streaming live on NBC.com.